In this article let us see on how to do a website speed analysis. We all know that google and other search engines have started to give very high priority to website loading speed. But, there are lot of factors which leads to the slowdown of the website loading speed. To find those factors it is very much necessary to find the loading time taken by the website page. 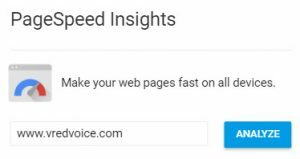 Google’s page speed insights is the number one tool to find a reliable data on page speed. You will be able to get various metrics related to page loading speed. 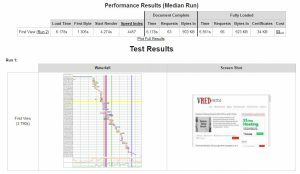 webpagetest is another top ranked website when it comes to find the website page loading speed. The most beneficial reason for anyone to use this website is through this website we can also choose the location from where we can test the loading speed of the website. Not only this users can also choose the browser to test the website’s functionality. This provides a detailed result on how the website performs on different browsers at different locations. Gtmetrix automatically finds the best server nearest to the range and gives a detailed report of the website. This website also provides you with more than 50 plus data of the analysed website. The best data among them is the website performance data through which we can get page speed score and yslow score. The average page speed score is 71% and the average yslow score is 69%. There is also a sector wise data on each loading elements of the webpage called waterfall. By using this waterfall data users can find which part of the page is affecting the speed of the webpage. In the page details tab users will be able to find the loading time of the web page, page size and number of requests required. Pingdom is one of the most popular tool when it comes to finding the page speed of the website. This website is highly user friendly and very easy to use. Although the number of results we get from pingdom is less when compared to gtmetrix, pingdom data is more reliable.Also, with the help of pingdom users will be able to get 7 differrent types of website data. Under this tab we will be able to find some common issues like caching issues, request size, DNS lookups, combining external css..etc. Under this tab pingdom provides the server response codes for the requests made. Here, users can know the total number of response codes the server is giving out while loading the web page. There are many response codes, which can be used to know the status of the server. The other results are content size by content type, requests by content type, content size by domain, requests by domain and file requests. Monitis page load speed checker is a simple page speed checker, users get limited useful data on loading speed. The data provided is separated into 3 regions United States, Europe and Asia/Pacific. Hence, these are all the important tools you need to find the page loading speed of your website. But, we also need to keep in mind that we should use more than one tool to arrive at a accurate data.